It's the last Flashback Friday of the year (and a very convenient time to have it, as the author is visiting family and far too focused on over-eating to write a new story this week). Flashback Friday is the brainchild of Michael D'Agostino; to learn more, click on the banner above! To stick with the spirit of the season, I found the original flash-length version of "Halitor at Midwinter." 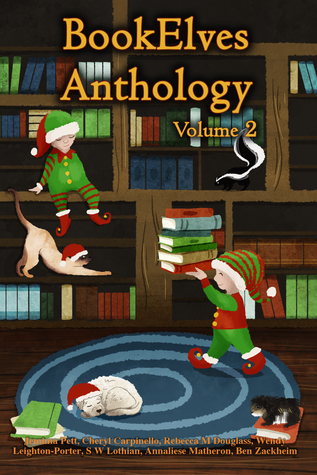 A longer version appears in the Bookelves Anthology, Vol. 2, along with six other winter tales by authors of wonderful books for middle-grade readers (as we like to say, for 10-year-olds of all ages). But for now, enjoy a cold night with Halitor. 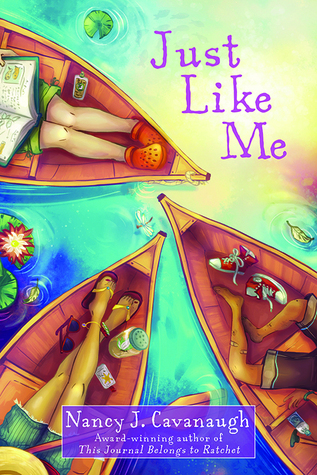 Publisher: Dial Books for Young Readers, 2013. 354 pages. This was a group read from my Goodreads Great Middle Grade Reads group, which is how I learned of it, since I hadn't seen it before. And I admit that though the general premise sounded good, I wasn't totally grabbed by it, nor was I immediately drawn into the book when I started reading. I think I was trying too hard to understand where we were; the "real world" felt just a bit odd even before we entered the fantasy world (I think because that real world is in Norway?). 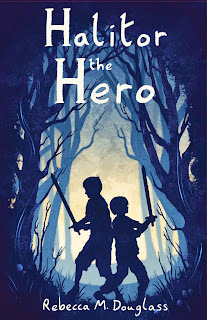 When the story did move into the fantasy realm of Sylver, I got more into it, but I was halfway through before it grabbed me and made me finish the rest in pretty much one sitting (staying up much later than I should have in the process). Sylver is well-realized, but I had a little trouble believing in it until the action got well under way. The land of the the Petlings is a little odd to me--frozen in an eternal winter, which unlike the winter in Narnia seems to be a happy thing for the animals. And there seemed to be some things that passed without much explanation, though I'm not sure if that was a flaw or helps the reader to feel with Lin, who has to figure much of it out on the fly. It might have been nice to be able to get a little acquainted with Sylver before Lin has to start racing about to avert disaster. It feels like a world that would be nice to see without threats around every corner, as well as making it a bit more plausible. Because Lin's mission is so urgent--it must be completed before that very midnight--and because time in Sylver is a bit elastic, the pace is both (for my taste) a bit too fast and a bit too unbelievable. I kept waiting for the poor girl to get a nap, as the roughly nine hours from her arrival to the moment the task must be completed seem to stretch to something more like a couple of days. I think that time frame weakened a generally solid story. Despite my reservations, this was an enjoyable read, and I think that children 9 and up will enjoy it. Most of them probably won't be worrying about how long Lin can keep going without rest, and will just enjoy her courage, stamina, and ingenuity. And the wintry setting makes it feel like a good holiday book! 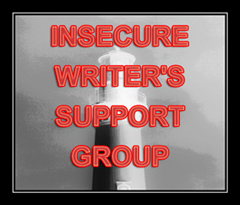 FTC Disclosure: I checked The Twistrose Key out of my library, and received nothing from the writer or publisher for my honest review. The opinions expressed are my own and those of no one else. I am disclosing this in accordance with the Federal Trade Commission's 16 CFR, Part 255: "Guides Concerning the Use of Endorsements and Testimonials in Advertising." Didn't get any good books for Christmas? Have some gift cards to use up? Consider picking up a copy of one of my books as a New Year's Treat! I'm a little late, but it's the season for chaos, so who's surprised? I decided to re-run a story from four years ago (! ), a bit I wrote about Christmas in Skunk Corners after the first Ninja Librarian book came out. Characters have evolved a bit, and some things might not quite match up with the second and third books, but it's a fun view of the town anyway. So merry Christmas, and enjoy the story! We’ve never been much for holidays here in Skunk Corners. Not until just lately, when my students figured out that celebrations mostly come with food. They thought Thanksgiving was about the best thing ever, what with the wild turkey and the baked squash and the pies that Tess brought for our celebration, unless maybe the real best was the Fourth of July picnic. There they had all the food they could eat and it was outdoors, so they didn’t need any manners. At least, that’s the way the kids figured it. After the success of those events, I began to wonder why we didn’t seem to celebrate Christmas much. Sure, some families did something, maybe a stocking with a bit of penny candy and an orange in it, and a dinner they took extra care over. Maybe they read about the baby Jesus in their Bibles. I don’t know much about that. But I’d been reading up on how folks elsewhere did things, and it made me kind of sad. Even the first Christmas in Little Women, when no one had gifts but Marmee and they gave away their breakfast, seemed to have something we were missing. At least, I didn’t have it. So, naturally, I went to the Ninja Librarian. Tom gave me a long, grave look, and rather than answering my question, asked one of his own, which I should have expected. “Did you and your father not honor the day? Or did you stop when he was no longer with you?” Funny how he won’t let me ask about his life, but he doesn’t stop at asking me about mine. He did what he always did when any question touched near to his own life or history. He said, “That was a long time ago.” Then he set me to doing more exercises so I could learn to be a Ninja fighter. The more questions I ask, the better I get at those moves. 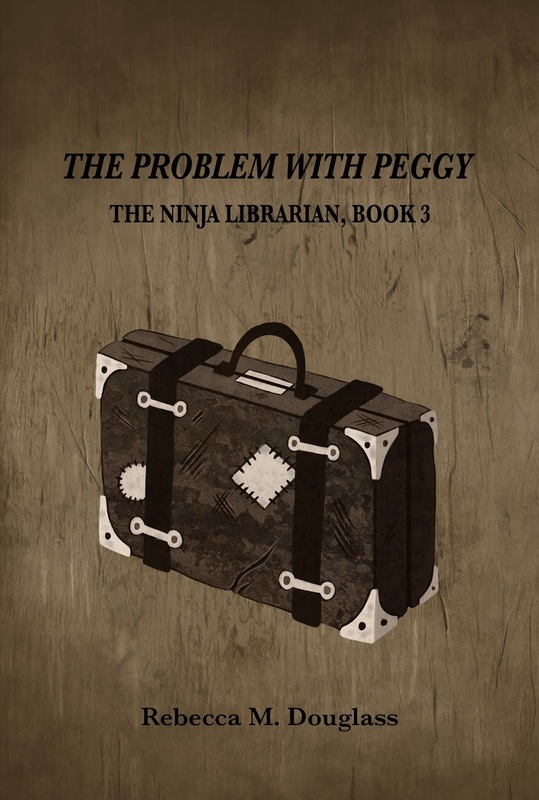 If I’m nosey enough, I might learn to be as good as the Ninja Librarian. Maybe not. He works twice as hard and more often, and he’s been doing it for a long time, though naturally, when I tried to find out how long, he set me to learning a whole new set of complicated moves. The idea of Christmas wouldn’t leave me, though. We celebrated another Thanksgiving, though I wasn’t sure to whom or for what we were being so all-fired grateful, unless it was that the Ninja Librarian had come back to us, and the fire didn’t burn us down, nor the roughs from Endoline take over our town. Which, come to think of it, was enough to be thankful for. But Christmas was just around the corner, and I didn’t know what I was going to do about it. If anything. Besides, I was busy. As the weather got colder, I found some of my students were frozen half through before they got to school, mornings. And those who had gotten coats the year before were sticking out of them by several inches at the sleeves. Tommy couldn’t even fasten his, because now he was in his teens he was starting to fill out some. He’d stopped dodging chores at home, and around school he tried to take the place of Hank and Yance, who were mostly working now, learning finer carpentry and even making furniture with Ike Holstead. I was working hard to get the women of the town to hunt out whatever old stuff they might have, and work it over to fit the bigger kids. The little ones were easy, since we could just pass last year’s coats down to them. And we were all making moccasins again, especially the ones stuffed with leaves and moss to keep the feet warm. So I didn’t have any time for thinking about Christmas. No one else said anything, so I decided to just let the idea drop. On the shortest day of the year I decided that I had turned eighteen, but I didn’t say anything about that, either. Pa would’ve made a big deal about it, like he did when I was thirteen, but he wasn’t here and I was too old to cry about that or anything else. I didn’t say anything more to Ninja Tom, and he didn’t mention the holiday to me, either. Though he did comment on midwinter’s night—he called it the solstice—and had the children make a note of exactly what time the sun set. “Way too early,” was Tommy’s assessment, and I agreed. Dark cold nights weren’t agreeing with me just then, though Tom mostly kept me from being cold by making me practice for hours until I could do each drill perfectly every time. Of course, we didn’t have any school on the 24th or the 25th. That was tradition, whatever else folks did, or didn’t do. Preacher Dawson would have thrown a fit if we had gone on. He held a church service on the 24th, and I suppose some folks went. I stayed in my room behind the schoolhouse and read. Every single book by Miss Alcott that I could lay hands on, until I got a bit tired of all the girls ending up married. Then I took to reading history, and stuck with the explorers who wandered the hot southern lands. That worked better for improving my mood, at least until I had to go out and get more firewood. On the 25th, I didn’t get out of bed when I woke up, not even when it got light. I just stayed where it was warm and read until the sun shone in my window. That got my attention, seeing as I hadn’t seen it for several days. I tossed back the covers, pulled on my dungarees over my long underwear, and topped it with a heavy wool sweater my Pa had worn. I was near as big as he’d been, unless the thing had shrunk. Then I headed for Two-Timin’ Tess’s Tavern, where I could count on a decent meal, as long as it was after ten in the morning. They keep bartender’s hours over there. I figured on having a lot of breakfast, since I hadn’t eaten a thing when I woke up several hours earlier—just picked up my book and started reading. My belly was flapping against my spine, as Pa used to say. I came around back to the kitchen, since it was much too early for the bar to be open, and stepped into a world of beautiful smells. Annie had been up far longer than I had, I decided. I could detect bread and apple pie and soup and maybe somewhere in all that a hint of the bacon and eggs I had thought I was looking for. I didn’t know what to say, but I knew a good invitation when I heard it. I sat down, and Tess shoved the coffee pot toward me. By the time I had poured a cup, Annie had filled two plates with bacon, eggs, and some kind of cake. Cake for breakfast seemed a bit odd, but I wasn’t in any mood to say no. I sailed into the food and didn’t even look at Tess until I was nearly through it. When I did look, she was eating as single-mindedly as I had been, if somewhat less rapidly. I looked again at Annie, who was pulling a pair of pies from the oven, and back at Tess, who shrugged. “For anyone who walks through that door hungry,” Annie said. I didn’t know what she was expecting, but I thought there wouldn’t be much of anyone coming in on a day like this. The wind had kicked up again, the sun gone away after luring me out, and the temperature dropped to something just below unbearable. In my opinion, no one in their right mind would go out. Unless, like me, they were in need of something to eat. Of course, she’d be feeding Johnny and the girls, and I figured Tom would be in. Like me, he’d taken to eating most of his meals at Tess’s. But no doubt everyone else would be sensible and go out only to do their chores. How should they know there was a feast at the Tavern? Yet, somehow, as the day went on, folks just seemed to happen by. Some came for a drink, and stayed for pie. But some, like Tommy, just happened to be passing by and thought they’d see if there was anything to eat around, and to show us how warm his new coat was. Hank and Yance came with a shelf they’d made special for Ike Holstead, and Ike just happened to come in with Janey about that same time. She had her mocs on, having outgrown her boots. Eunice had those now. I know, because she stopped in too. Crazy Jake and Wild Harry Colson were working, but the train stopped in town for an hour, long enough for my two oldest students—getting on into their twenties now—to come by for a turkey sandwich, pie and coffee. And for help with a report they had to write about a mishap on the line, so I figured that was their real reason, and the food was their luck. Those two would never turn down a good meal, no more than I would. Me, I couldn’t see any reason to go back to my cold room, so I just stuck around and had a bite when I felt like it. Everyone who came in gave me a friendly “Merry Christmas,” and Tom had brought his chess set. He was teaching me to play, though Pa had made a start at it that last year before he died. Ninja Tom was a tough teacher, but that day I won two games, and figured I was making progress. It finally wound on down to night, the last piece of pie went down Johnny’s gullet, and I headed back to my book and my bed, pretty pleased with the way the day had turned out. Maybe I’m not as bright as a teacher ought to be, because it wasn’t until I was drifting off to sleep that it occurred to me to wonder if all those folks stopping in had been such happenstance after all. Maybe it had been some Christmas magic, conjured up by some folks who wanted me to think maybe I had a family after all. Maybe Tom had even let me win those chess games. The longest night of the year, and the turn to more light. I can't wait. Even living as far south as I do, the winter days are too dark and too short! (Those captions are from Gerard Manley Hopkins, "God's Grandeur"). And with that for the nod to the solstice, a little year-end fun. This blob will be a bit spotty in the next week or two, so this is my reading round-up, with a little help from Bruce's Shelfies at The Bookshelf Gargoyle: My year in books. Take these answers in the spirit intended, and check out Bruce's year! If you want to join the fun, just be sure to give the Gargoyle due credit. I'll give a nod as well to Jemima Pett who called my attention to it! 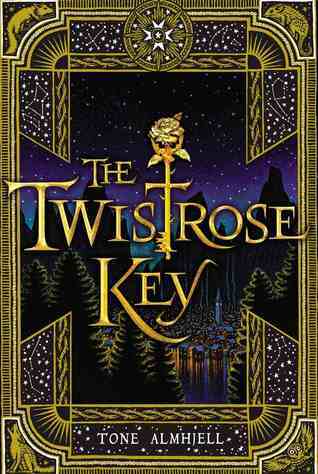 Titles link either to my review or to the book's Goodreads page if I haven't posted a review. There are a number here that I assumed I had reviewed, but apparently just read and enjoyed! Publisher: Listening Library 2015. Hardcover by Clarion, 2014 (337 pages). Dragons have invaded Crumbling Castle, and all of King Arthur's knights are either on holiday or visiting their grannies. It's a disaster! Luckily, there's a spare suit of armour and a very small boy called Ralph who's willing to fill it. Together with Fortnight the Friday knight and Fossfiddle the wizard, Ralph sets out to defeat the fearsome fire-breathers. I wasn't quite sure if I was going to be disappointed, because these were among Pratchett's earliest published stories, and you know how that can go. I needn't have worried: they were great. 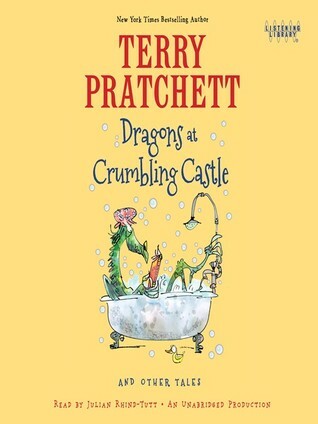 Witty, insightful, well-written and also well-read, they were everything I love about Terry Pratchett. The title story is a delightful bit of nonsense...and so are the rest. The Carpet People make their first appearance in these stories, and I'll have to see what he did with them later, because they are wonderful, and their world is beautifully realized. The stories, especially "The Speck" and some others show an early tendency to the political satire that became Pratchett's hallmark. In these stories it's mild, in part because they were written for a juvenile audience and in part (no doubt) because the writer was himself about 19 at the time. Adults will be entertained by the multiple levels of satire, but children will love the goofiness of many of the stories, so it's good for the family. Julian Rhind-Tutt does a fantastic job of reading the stories, and his timing as well as his lovely British accent add a lot. I am tempted to say that everyone should listen to the audio version, but then I saw that the print version is illustrated, and if the illustrations are anything like the cover picture, I want to see them, too. So I guess one has to get both. It occurs to me that this book would be a great family read-aloud, or use the audio book for the long drive to Grandma's for Christmas. You won't be sorry. FTC Disclosure: I checked Dragons at Crumbling Castle and Other Tales out of my (digital) library, and received nothing from the writer or publisher for my honest review. The opinions expressed are my own and those of no one else. I am disclosing this in accordance with the Federal Trade Commission's 16 CFR, Part 255: "Guides Concerning the Use of Endorsements and Testimonials in Advertising." 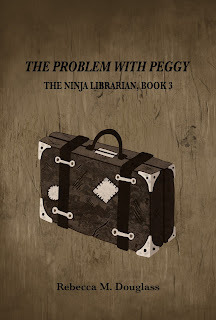 And if goofiness is something you enjoy, be sure to check out our Ninja Librarian series, including the latest, now available from Amazon and Smashwords, as well as other on-line bookstores. Or order signed copies direct from the author! This is a bonus post, because it's time for blogger D. L. Hammons' Deja Vu Blogfest--a day to share a favorite post from the year for a second time. Since this is all about seeing some great posts we've perhaps missed during the year, I'm going to put the linky-list first, and then share my post. And now for my post. It wasn't easy to pick one, but I decided to share one of my photo pages, even though I'm a writer and it should be all about my writing. 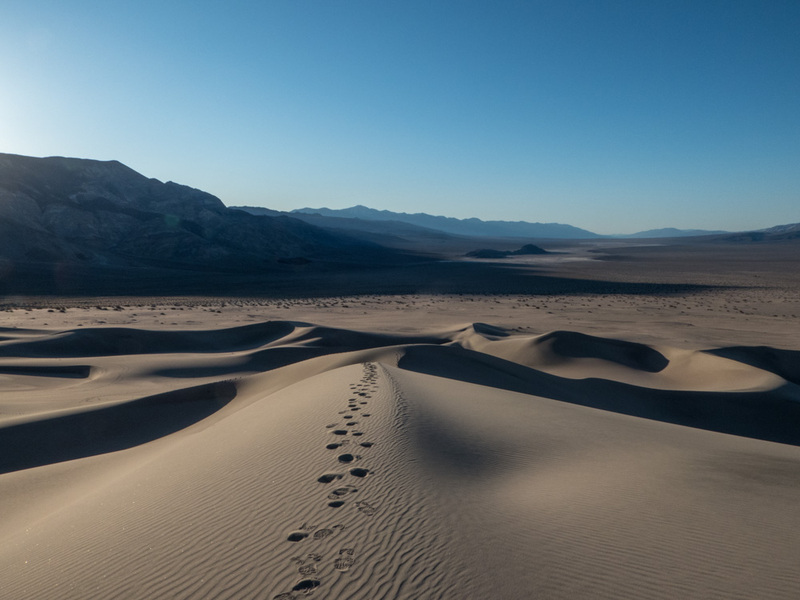 After a bit of looking, I choose...Night Hike to the Panamint Dunes. If you like it, you can see more from the same trip here. 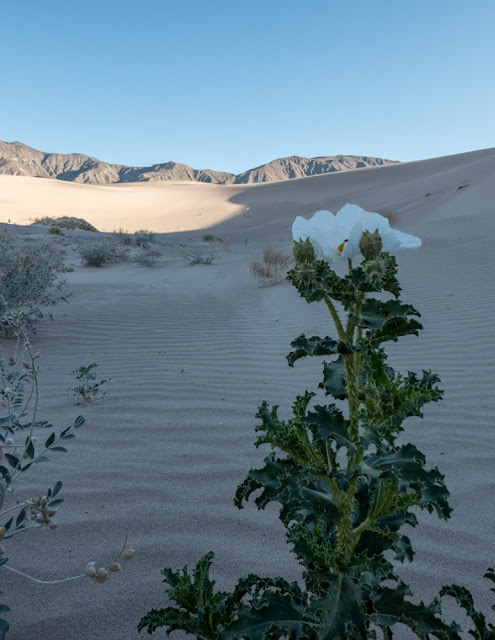 Back in March we visited Death Valley and the environs in search of stunning desert landscapes and spring wildflowers. We found both. 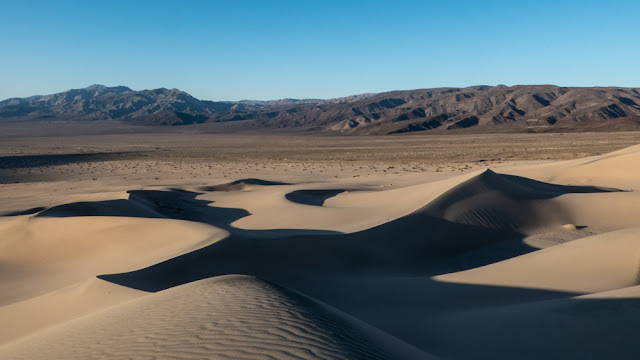 The Panamint Dunes are located in the far north end of the Panamint Valley, which is the next valley west of Death Valley proper and part of the National Park. Six miles of rough dirt road behind us, and a hasty dinner prepared and eaten, we hoist loaded packs as the last of the evening light fades away. The sun set early behind the Inyo Mountains, and at 8 p.m. the full moon isn't up. 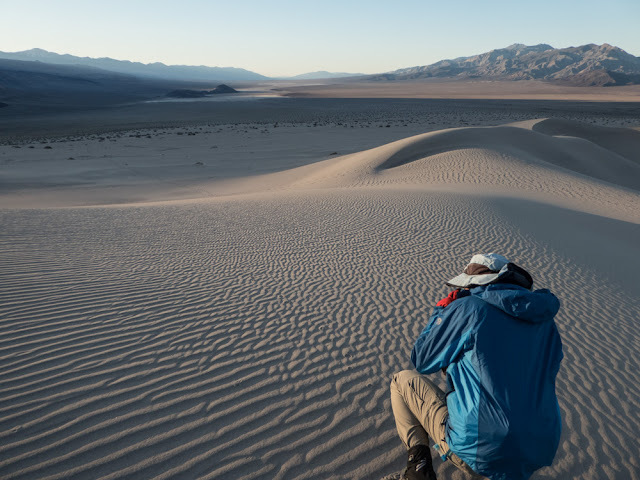 Even so, we can see our goal: the Panamint Dunes are pale in contrast to the surrounding mountains and the scrub-covered alluvial fans that surrounded them. Headlamps, even though I forgot to replace the dying batteries, are enough to show us the footing and avoid injuries as we pick our way over rocky ground near the parking area. Bits of the mountains have washed down the slope toward the dry lake bed in the bottom of the valley. The poor footing for the first quarter mile worries me. If it's like this all the way, it will be a very long hike indeed. 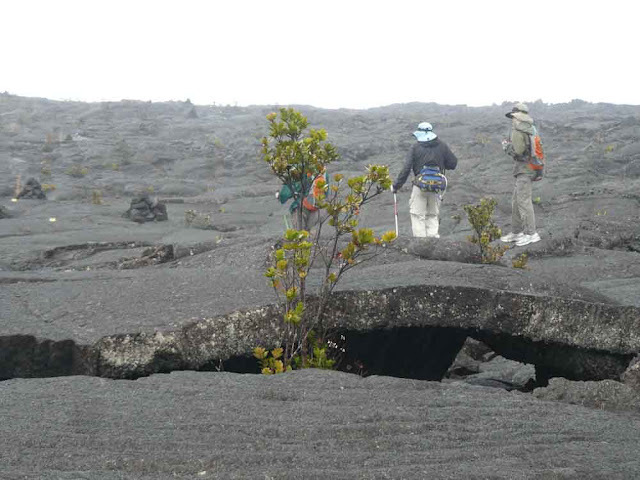 Happily, we soon pass the rocky portion of the fan, and the rest of the 3-mile approach provides fairly smooth footing. 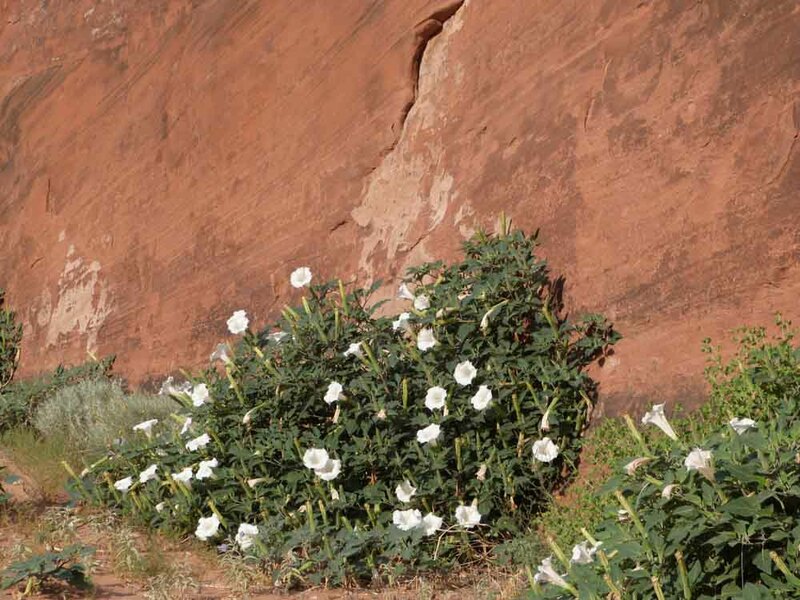 We pick up the pace, dodging around bushes and following sandy washes where they angle off in more or less the right direction, abandoning them when they move too far upslope. 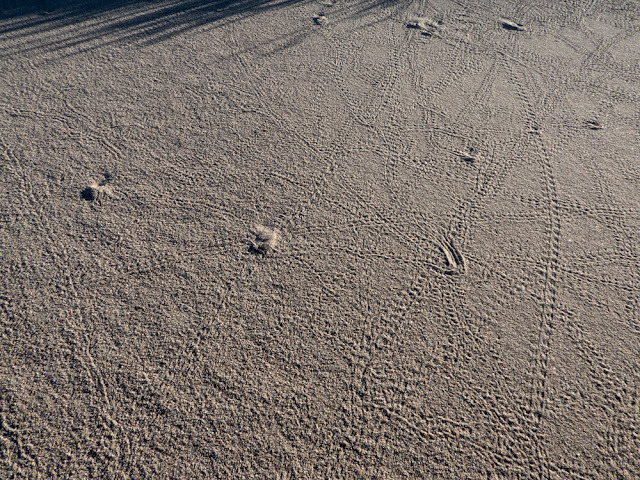 There are footprints in places, telling us less that we are on the right route than that pretty much any route will do, as long as we keep pointing at the dunes. The full moon should have risen as the sun set, but the ring of mountains means that the early sunset is followed by a delayed moonrise. We hike for 20 or 30 minutes before it tops the ridge to the east. Light hits the dunes first, giving them a ghostly beauty. When it reaches us, headlamps become a silly waste. The moon is brighter. We turn our lamps off and let our eyes adapt to the night. 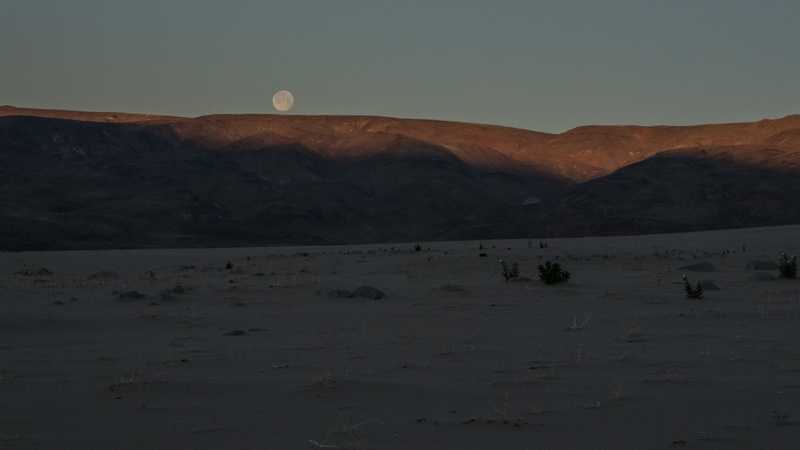 A deep shadow lies between us and the dunes, but though our pace is fast, the moon rises faster. We never catch the darkness, and move with greater confidence. Just over an hour sees us over three miles in, 700-odd feet higher, and starting to sink into the sand. Vegetation is thinning and it's time to make camp. The moon allows us to do that still without lights, so that though we realize that others are camped a few hundred yards off (mysteriously, they keep their lights on, even while sitting and presumably enjoying the night) they probably don't know we are there. 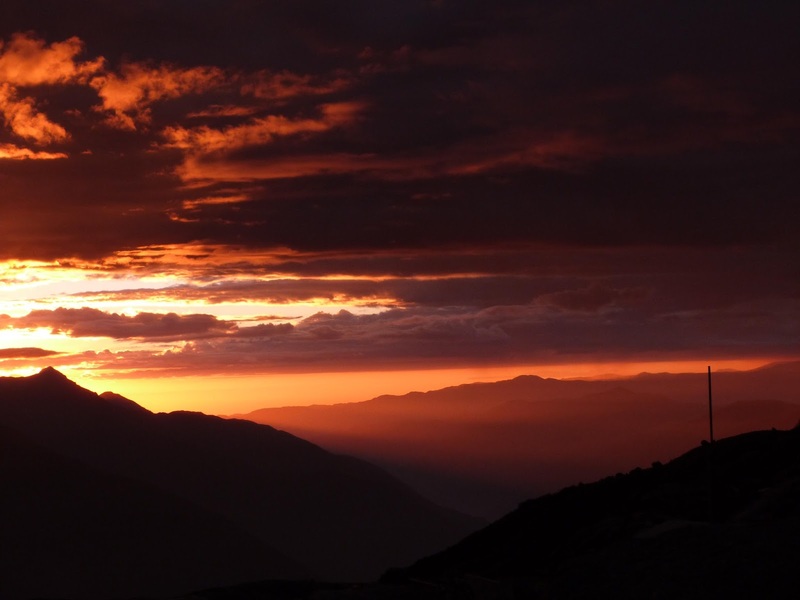 The night is calm, and the view well worth savoring. When it grows too chilly for comfort, we crawl into our bags, knowing we'll be up well before sunrise. 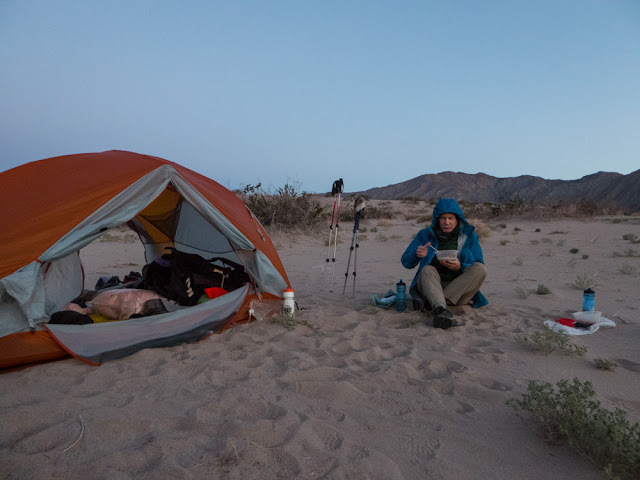 Our early start means that we have eaten breakfast and are well up the dunes (which rise only a couple of hundred feet beyond our camp) before the sun hits. The morning is best told in photos. 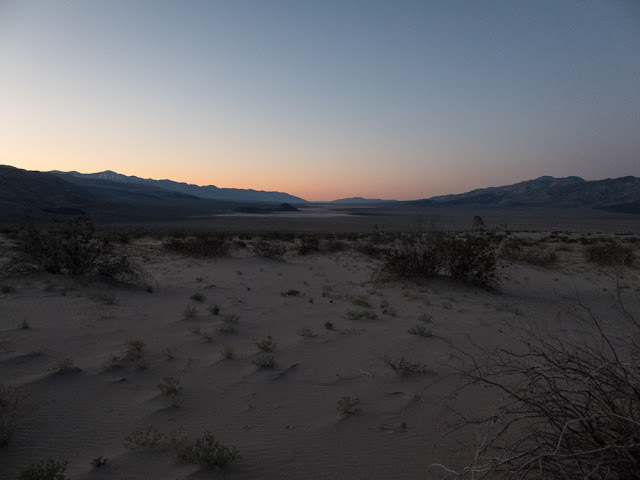 Dawn breaks on the Panamint Valley. Desert mornings can be chilly. We are well-bundled to eat our cold cereal. As the sun rises, the moon sets over the Inyo Mountains (we really only see the foothills here). 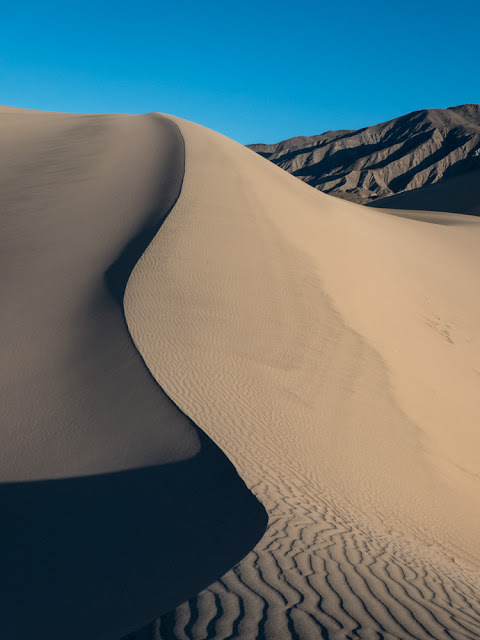 Dune fields yield endless patterns of light and shadow and texture. Curves and shadows and contrast with the eroded hills beyond. 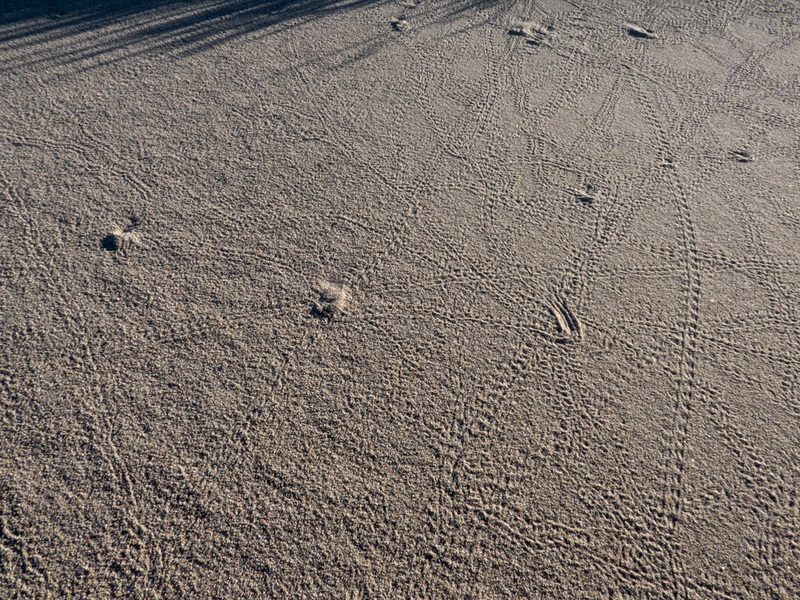 Even footprints add to the textures. 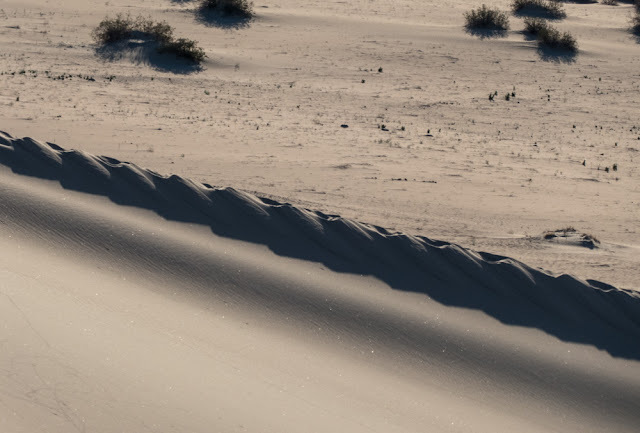 Low sun turns footprints along the ridge into a braided piping for the edge of a dune. If you think a dune is a dead place, look more closely. More like Grand Central Station! 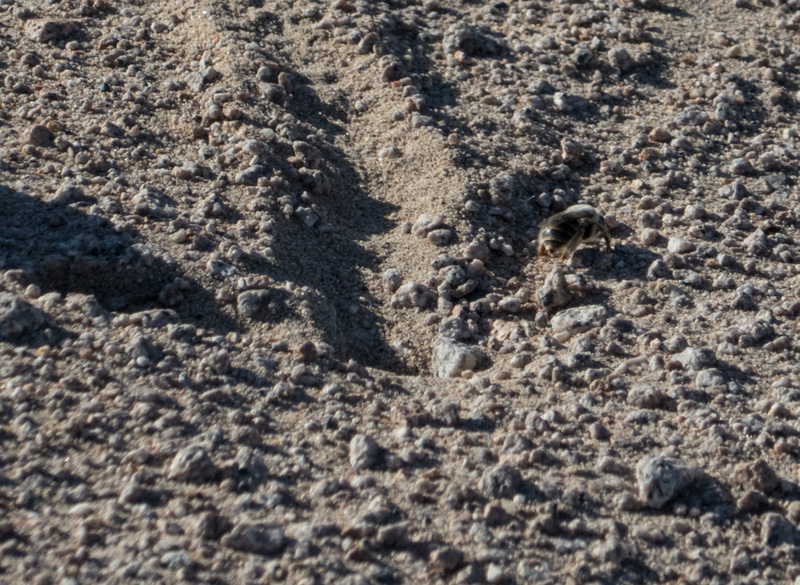 There were also some kind of ground-dwelling bees, busily digging their holes. Not the best photo. The bees wouldn't hold still. 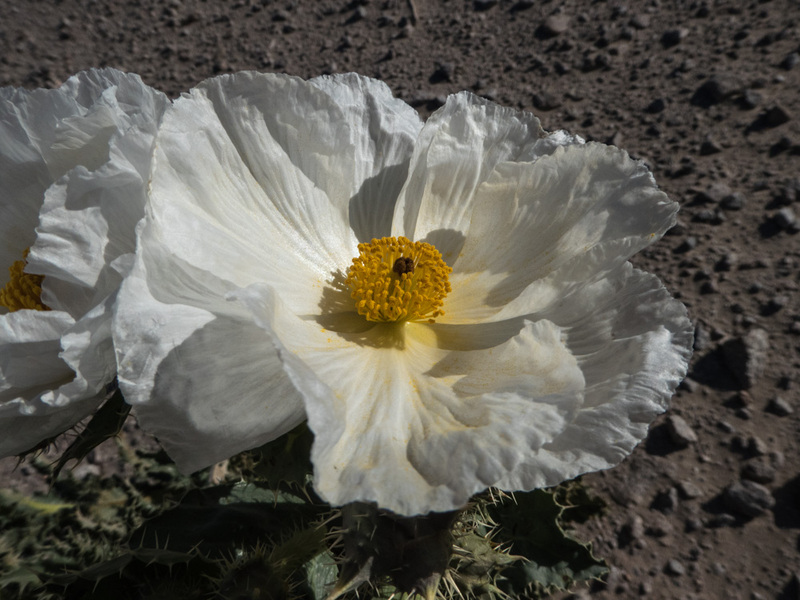 Seems like every dune field we visit has a characteristic species. In this case, it was the prickly poppy. 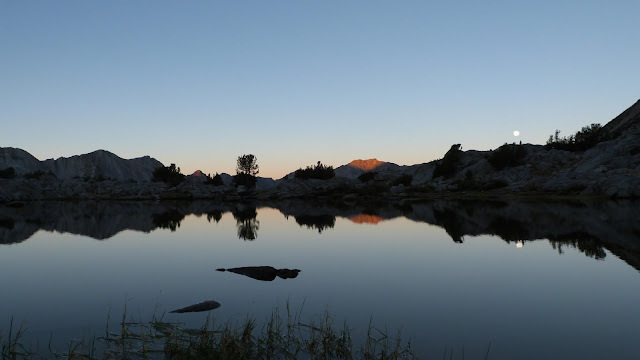 When the sun grew hot, we returned to our tent, broke camp, and hiked the hour back to the car. Just for fun, here's our rather low-clearance Prius trying to cope with one of dozens of small gullies/washes that crossed the road. 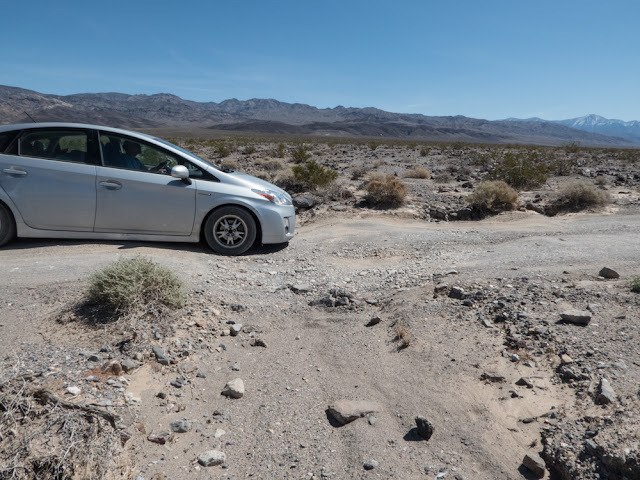 You can drive a lot of "4wheel drive" roads in a small sedan, if you go very slowly...and can muster a certain indifference to the sounds of the car depreciating beneath you. Millicent slid her glasses down her nose and looked at the page who shelved books most afternoons. “A Yule tree,” Pongo said, not quite daring to look at the head librarian. “Oo, er, no mum,” the ogre muttered. “He bumped my table,” the banshee began. His voice quickly rising toward the usual banshee wail, he closed his mouth abruptly at Millicent’s hushing gesture. The banshee looked relieved. The head of security was a dragon, and he either singed or ate anyone he had to discipline. The ogre, however, remembered, as too few patrons did, that Millicent was a trained wizard as well as a survivor of the slums of Erlintown, and not to be trifled with. “Yes, mum,” he said, and staggered off in the direction of the books on manners and etiquette. Millicent watched him a moment. Hmm. An ogre looking for social advancement. Wonders never ceased. She turned her attention back to the banshee. “You will be quiet, won’t you?” Her smile had nothing of warmth and everything of threat in it. The banshee nodded. “Now, then, Pongo,” Mil said, returning to where the page watched in awe, trying to memorize everything she’d done. He pulled himself back to the point with an effort. “Yair, a tree. I know where to get one,” he offered. The page’s shoulders slumped a little, but he recovered, and went off to fetch the tree. Two days later, neither was so happy. Two days, and two trees. They hadn’t even had time to decorate the second one before disaster struck. In the morning, Millicent hadn’t been sure at first what was missing. The library looked as it always did. A faint scent of sawdust puzzled her, but she could see no signs of damage. Crossing past where the tree had stood the night before, she caught a scent of pine, and saw a few loose needles, but there was no tree. Puzzled, she looked around. Then she set her lips in a firm line. Someone had stolen their tree. This could not be permitted. But for the moment, she was more concerned to replace it before Pongo saw and broke his heart. The boy seemed to set store by the Yule tree, even without candy. On the way to the library, Mil had noticed that there were vendors selling Yule trees nearby, and she went back out and purchased a new tree, using her lunch money. She brought the tree back—Mil looked small, but managing the books of her library took a bit of muscle, so she had no trouble carrying the modest tree up the steps and into the library—and set it up where the other had been. Then she walked the stacks, looking for signs that anything besides the tree had been damaged. 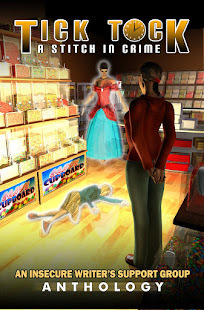 She saw the needles and a bit of sawdust on the floor in the aisle by the spelled books, those books that had powerful magic and were a law unto themselves. And there were more of them than there should be. Millicent counted, just to be sure. Yes, someone had come and taken their Yule Tree and left four new books on the shelves with the Spelled Books. Not having a death wish, Mil didn’t open the books. Let one of the more foolish young wizards do that. She would watch and learn what they contained. It was how she had become one of rather few wizards to last well into adulthood, and still maintained an accurate card catalog. Meanwhile, she needed to get more ribbons to decorate the tree. Pongo's shout brought Millicent back out with a brisk stride. One did not run in the library, any more than one shouted, but a librarian learned to cover the ground in a hurry nonetheless. Pongo stood well back from the Yule tree, and with good reason. A line of books ran from the shelf of spelled books to the tree, and the foremost book was...eating the tree. After a minute, it spat out something. Mil dared to draw near enough to see that it was a book. The spelled books were cutting out all the middlemen, and producing books directly from the tree. "This. Will. Stop!" Millicent commanded. She took up a pair of heavy leather gloves and approached the books. Pongo let out a little admiring "Ohhh!" as she began corralling the spelled books, wrapping them in the heavy leather straps that would keep them closed and well-behaved for a few hours. She slapped the one that was digesting the tree, and it burped out a tiny volume. That one got a strap too. When the books were all subdued and reshelved, Mil looked at the draggled remains of their tree. "I think," she told Pongo, "that we need something different here." An hour later, they strung a curly ribbon around their new Yule tree, built of stacked books. She'd not dared use the spelled books, but the rather ill-behaved books of economics were at the bottom of the stack. Millicent stepped back to admire as the first patrons of the day entered the library. The ogre and banshee of the previous day stood shoulder to shoulder, admiring the tree, and moved on into the stacks, apparently at peace. Thanks to Colleen, who created the book tree at our library, and gave me the idea! I wish I could recall who gave me the recommendation to read this one, because it was a real pleasure. 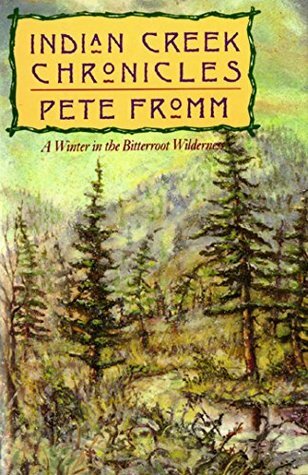 Fromm's account of his winter alone (mostly) in the Bitterroot Mountains wraps up a whole lot in one package--everything from an environmental message to a coming-of-age tale to a young man's simple delight in pushing his limits. 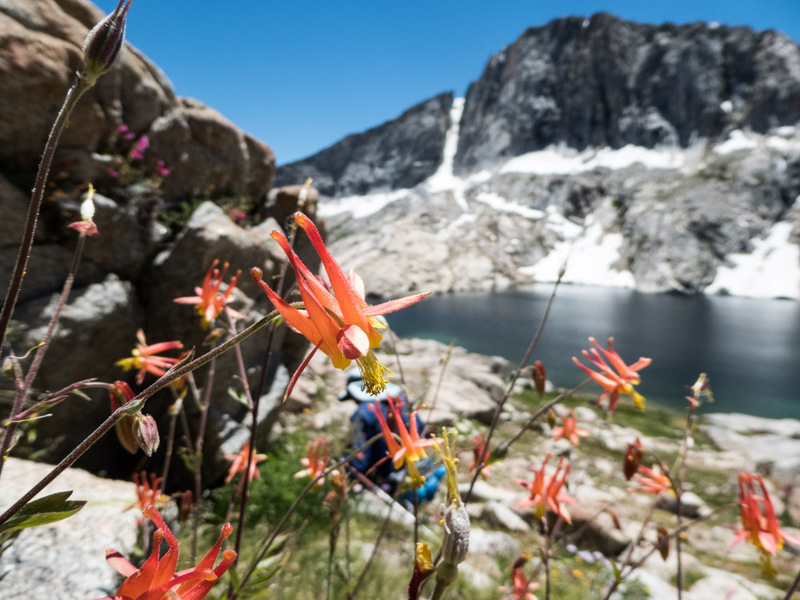 Many young people come to a love of wilderness through a summer spent working in a park or at a camp. 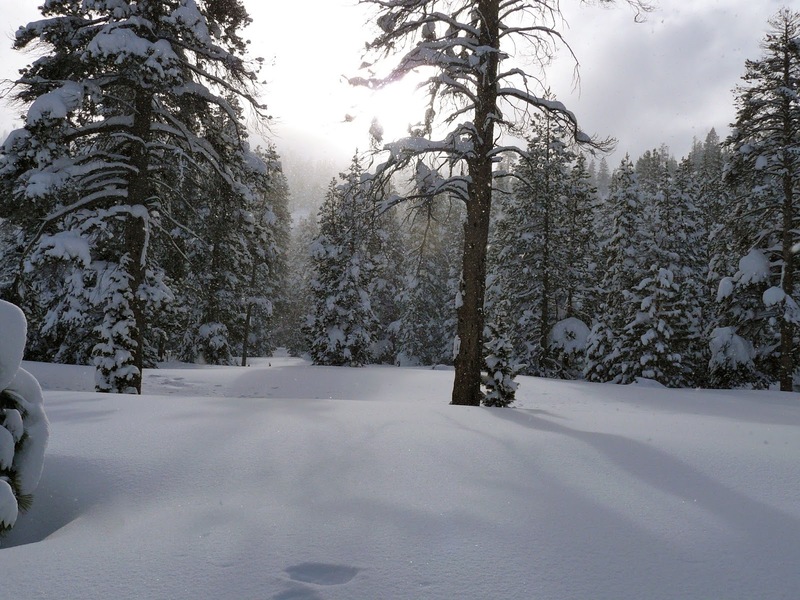 Pete Fromm got there by spending a winter snowed in along a creek in the mountains of northern Idaho. He dropped out of school to babysit a creek full of salmon eggs, not because he had any particular environmentalist leanings, but so he could "have a story." 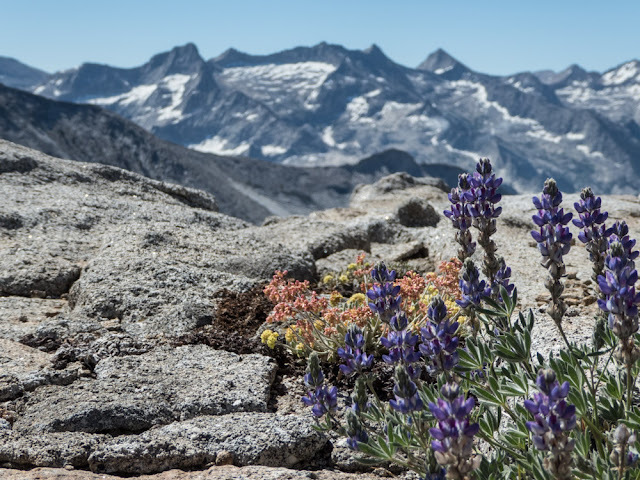 His sole knowledge of the wilderness at that point appears to have come from reading a lot of books about mountain men, and he takes the job out of a romantic desire to emulate them. It's a desire that directly contributes to his misery in the first months in his tent. Fromm has to learn everything he needs to know on the fly (and much of what he needed to know about food, he would have done better to have learned before he went, as he was pretty much stuck with what he bought). Having gone with the intention of being a "mountain man" and making his way by hunting, he finds that he not only has to learn to hunt, but then has to learn to deal with the conflicting feelings he gets from acts of mountain-man derring-do that result--he realizes abruptly one day--in the death of an actual living thing. He manages to balance that for the creatures he eats, but his trap line doesn't last past his first kill. This is a quick and easy read that is good for anyone who loves the wilderness--or thinks s/he might. Some events in the book may be a little disconcerting to our 21st-Century ideals of wilderness travel, but bearing in mind that it was 1977 and Pete was only 19, he actually did amazingly well at developing a wilderness ethic. FTC Disclosure: I checked Indian Creek Chronicles out of my library, and received nothing from the writer or publisher for my honest review. The opinions expressed are my own and those of no one else. I am disclosing this in accordance with the Federal Trade Commission's 16 CFR, Part 255: "Guides Concerning the Use of Endorsements and Testimonials in Advertising." Another week without a prompt from Chuck Wendig, but I had it covered, thanks to the story I couldn't finish in time last week. I used a random title generator, and got "The Four Awakenings," which I changed a little after I finished the story because I felt like it. The setting must have been inspired by how cold me feet have been lately! My first awakening was simple, and normal. When the sun came up, I opened my eyes, same as any day. Sleeping, then not sleeping, just as usual, and really only about three-quarters awake. That morning, opening my eyes was about the last normal thing that happened. I rolled out of the sack, and instead of my bare feet hitting the fuzzy rug that’s been by my bed since I was ten—that’s 15 years, for those of you wondering—they hit sand. Mom bought that rug at a rummage sale, and when she brought it home I hated it. It was tacky, and pinkish, and dated even though it was brand new. But I kept it anyway, because it was fuzzy and warm on my toes. None of which mattered now, because the rug was gone. That was my second awakening, you might say. When the ground under your feet has literally moved, or at least changed completely, you tend to pay attention. My eyes snapped open the rest of the way, and I noticed that the sun was a lot brighter than it should have been. It was hot, bright, and my rug was gone. So was my room. I was standing in a desert, nothing but sand anywhere, and wearing nothing but my skivvies because I was too cool for PJs. I was now very awake indeed. I didn’t know if I should stay put and hope my bedroom reappeared, or start looking for shelter and water, because I was definitely not equipped for desert survival. I could feel my skin burning already, after five minutes in the place. That made my mind up for me. I would have to find shelter and water. If there wasn’t any to be found—the very uniform nature of the sand worried me—then I was toast. Take either meaning of that; both work. So much for the first two awakenings. The third awakening took longer, because I thought I was about as awake as I could get. I walked for a long time. Nothing changed, except that I grew hot, tired, and thirsty, and my skin continued to burn. Also, my feet began to feel raw. The sand was smooth and free of burrs and stones, but my 21st-Century office-worker feet were tender, and the sand began to feel like, well, sandpaper. Coarse grit. I swore a lot, but I didn’t stop moving. After a while, I had to stop swearing aloud. My mouth was too dry. I was in a sticky spot and no mistake. You might way that was my third awakening, though it was more of a gradual thing than the others, and like I say, not a physical waking up. I realized that I was going to die, and not in the abstract “we all have to die someday” sense. This was concrete and personal, and when it sank in I got mad. When I got mad, I took action. In one sense, of course, I’d been taking action from the start, as best I could, looking for water and shelter from the sun. I was starting to second-guess that decision: maybe I should have stayed put until the sun went down, instead of walking through the heat of the day. Maybe not, with no way to shade myself from the sun at all. Maybe it didn’t matter. The action I now took was to think about how I got there in the first place. I don’t know too many people who could make me wake up somewhere other than where I went to sleep. And there was something not quite right about this. No desert I ever saw was so smooth and purely sandy, for such a long way. Maybe some parts of the Sahara were; I hadn’t been there. 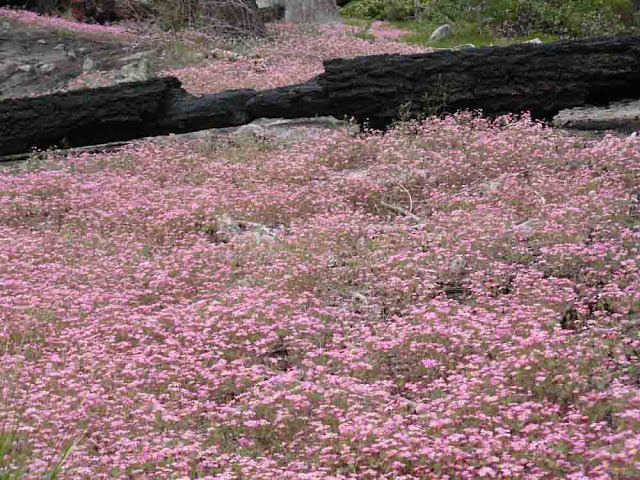 But I knew no desert in North America looked like this. Probably none on Earth. Once I’d figured that out, I thought of Sarah, who’d long since promised to send me to hell. This looked like a good approximation. Knowing who was behind my troubles gave me something to work with. I didn’t have any magic to counter whatever she’d done. I didn’t even know how to make her hear me protest. All I could do was to refuse to believe. See, I’d learned a long time back that magic can’t affect you if you don’t believe it can. * It’s the best protection you can have. The challenge is not believing. It’s hard to generate genuine unbelief when your whole body knows you are barefoot in Hell. I mean, my feet hurt. 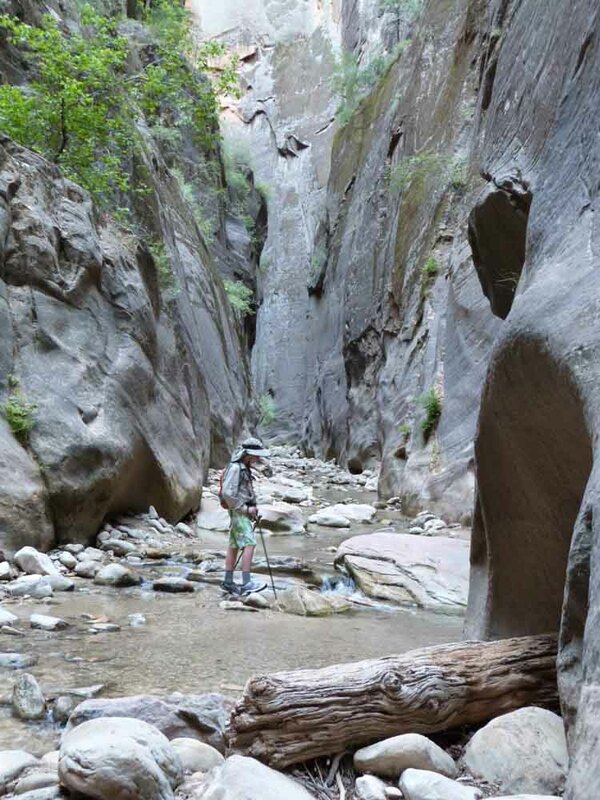 I had to overcome abraded feet and burned skin and sand in my skivvies and a mouth so dry I couldn’t speak, and make myself believe I was still at home in bed. That might have been the hardest thing I ever did. I stopped walking, lay down, closed my eyes, and told myself that I was in bed, it was a little chilly in the room, and I needed to get up and go pee. I figured if I could believe that last, desiccated as I was, I had the thing in the bag. After a long time, I swung my feet over the side of the bed, curled my toes in the fuzzy rug that covered the cold hardwood floor, and enjoyed my fourth awakening. Then I went in search of Sarah. I had a score to settle. *This is clearly related to the power of belief to create magic, as practiced in every production of Peter Pan, where the applause and belief of a room full of little kids keeps Tinkerbell alive. Like what you read? Consider buying my books, including the latest, now available from Amazon and Smashwords, as well as other on-line bookstores.Or order signed copies direct from the author! Time for a huge sigh of relief: I survived the insanity of NaNo! Time for a sigh of another sort: I'm not done with the book, and I had to take several days off from writing as soon as the month ended, to attend a conference. Now that's done and I'm digging out from under the home chores I neglected. Renewed respect for those who have full-time jobs and families and still manage to write even 100 words a day. You rock. As for how NaNo went: I hit and passed the 50K mark (ended the month at 52,196), and have at least a partial image in my mind of how the rest of the book goes. I'm still hopeful that I can keep up the pace and finish before Xmas. Of course, I'm also at that point in the book where I am suffering serious doubts about what I'm doing and if I've really muffed it this time. It always seems to hit me about this point in a book (somewhere around 2/3). Last year, I made it to about 7/8, and then, lost and confused, let it slip away from me. That's not happening this time (and last year's book is next up, for a fresh take with me ready to do the work it needs to get finished). Now on to this month's IWSG question of the month, which is a good one. As in, one I haven't really given any thought, even though when I see it it's obvious I *should* be thinking about it! I suppose if pushed, I'd just say that I expect to be doing about what I am now: writing books and publishing them at whatever pace I manage. But that's not exactly a career plan. It's probably realistic enough: it means just continuing to do what I'm doing, which is taking myself as a writer about 75% seriously. That might be okay. But a part of me would like to finally start taking the risks I need to step it up a notch: writing and submitting short stories, maybe even shopping Gorg around to the publishers instead of doing it myself. So for a happy vision of five years from now, I see myself with a bunch of refereed publishing credits under my belt. Okay, your turn. What's your plan? Or if you don't want to go there, how did your NaNo go? Publisher: Books on Tape (original: Alfred Knopf, 2011, 291 pages). Inspired by a lifelong passion for Austen, P.D. James masterfully re-creates the world of Pride and Prejudice, electrifying it with the excitement and suspense of a brilliantly crafted crime story, as only she can write it. I suppose this is fan fiction, only that sounds absurd when the writer is one of as much stature as P. D. James! Still, the book seems to stand in an in-between space between James' own work and an effort to sound like Jane Austen. And the book sits somewhere between a mystery and an Austen novel. 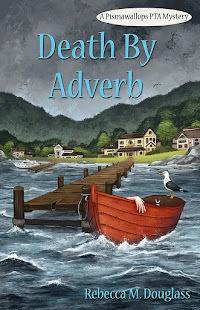 There is a murder, but Darcy and Elizabeth are not sleuths, even amateur ones. The mystery unfolds on its own, in fact, without any sleuth at all, and in the end I felt...cheated. That's not to say I didn't enjoy the book, because I did. I love Jane Austen, and it was fun to dive back into her world. It was also a pleasure, if a somewhat guilty one, to see how that match between Darcy and Elizabeth works out. The prose is a good match though at some points it feels like it's working too hard to match, and the narrator is excellent. It's just that in the end, it isn't Jane Austen. And it didn't feel like it was PD James, either, because the book doesn't really do what James did best, either: it didn't present a complex and satisfying mystery. It's a bit of a tricky call. It's a pretty good story, so if you are a fan of either Austen or James, and open to having them both a bit shifted from their usual natures, it might be a go. But if you are like me, you might want to go on imagining your own future for Darcy & Elizabeth. 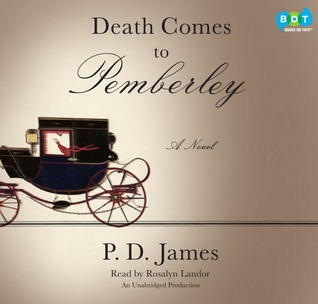 FTC Disclosure: I checked Death Comes to Pemberley out of my library, and received nothing from the writer or publisher for my honest review. The opinions expressed are my own and those of no one else. I am disclosing this in accordance with the Federal Trade Commission's 16 CFR, Part 255: "Guides Concerning the Use of Endorsements and Testimonials in Advertising." Okay, the first order of business is congratulations to Jacky and Shelli, winners of the giveaway for e-copies of The Problem With Peggy. Happy reading! Next, we have one more week without a new story, because I'm attending the California School Board Assoc. annual conference this week, and haven't had time to write a story (I made a start, but have only about 1/3 of a story, about 30 minutes to bedtime Thursday night. Not happening. I'll finish it and use it next week!). Meanwhile, I'm learning lots to help me lead our school district, which is a pretty amazing thing to be able to do. So, as so often when I've no stories for you, I've gone into the archives for some photos to serve as a Friday distraction. 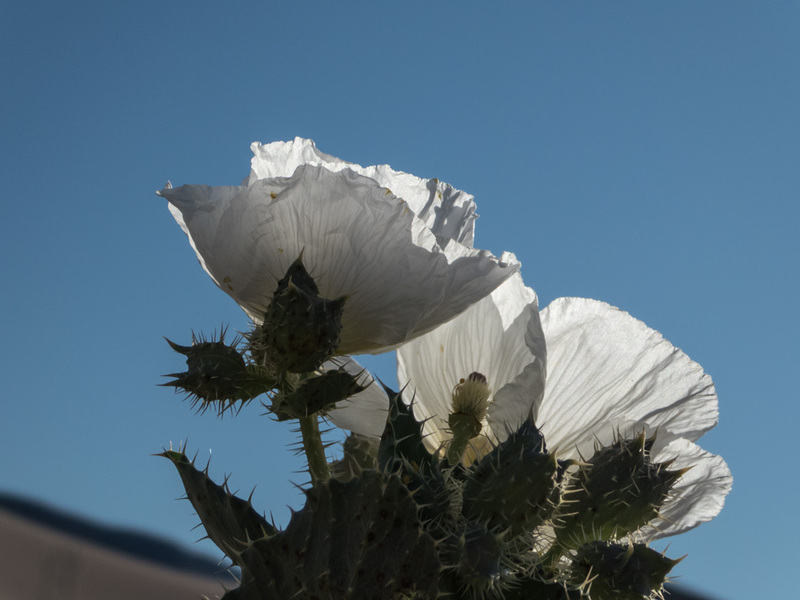 And since a lot of us have been feeling like things are kind of tough the last few weeks, I picked out photos of things growing where you wouldn't think they could. I am always amazed at what grows in the desert, though of course the canyons are where the water is. 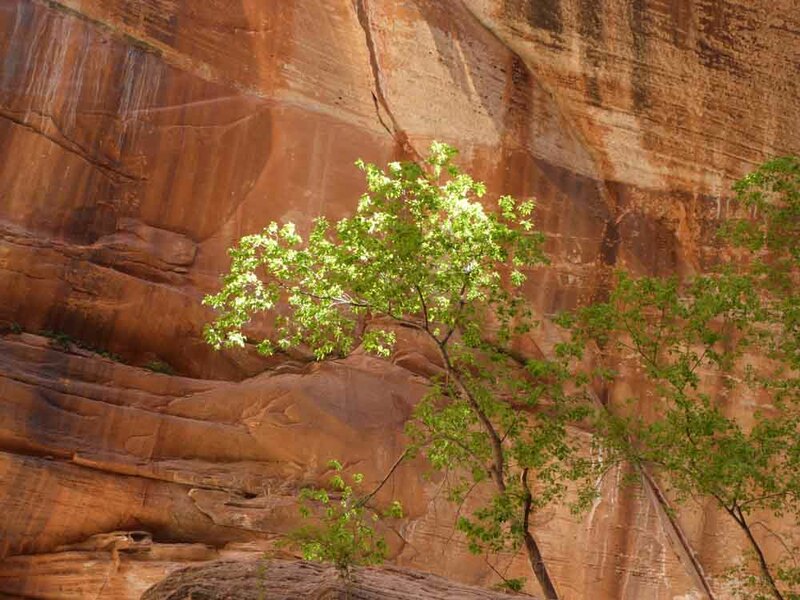 Cottonwoods in the Narrows, Zion National Park. Okay, this one's a cheat. 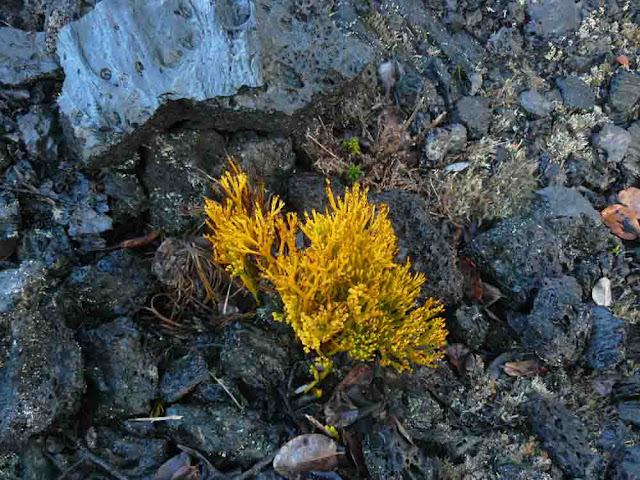 It's actually growing in a pretty decent spot, in a moderate-elevation forest. 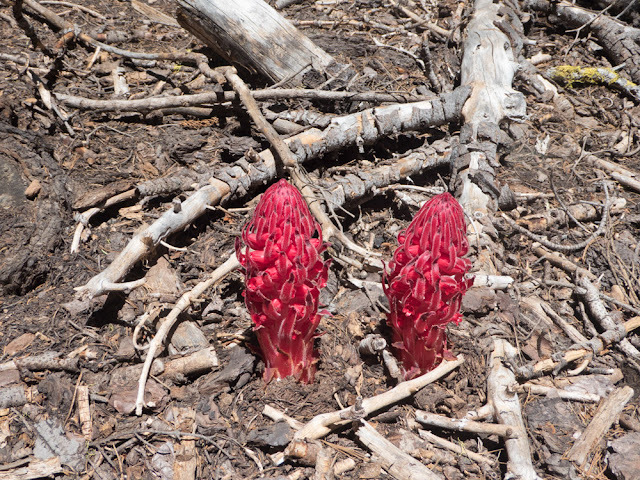 I just think they look so unlikely--some kind of saprophyte, which live on decaying matter rather than photosynthesizing (thus the lack of green bits). I hope the photos gave you something to smile at, and a bit of hope!